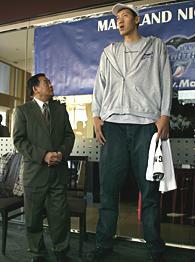 The Maryland Nighthawks of the American Basketball Association introduced Sun Ming Ming, a 7-9 center from China. Nighthawks coach William Rankin expects Sun to be able to play about 28-30 minutes a game; his debut comes Saturday. That will also be Rankin’s debut with the Nighthawks — he was hired about a week ago from a junior college team. Sun went through two operations for a pituitary tumor that led to his extraordinary size but threatened his life. Sun said those procedures were successful and he’s getting into shape. The NBA doesn’t overlook 7-footers.